Shoulder instability is a condition where the shoulder repeatedly dislocates (comes out of joint) or subluxes (partially dislocates). It is often a painful condition, but some “loose jointed” people can purposely dislocate and relocate their shoulder without pain. The most common type of shoulder dislocation is anterior where the head of the humerus (ball of the shoulder joint) comes out the front of the joint. Though less common, the shoulder can also dislocate out the back or in multiple directions in cases of multi-directional instability. What are the signs of shoulder instability? The signs of a shoulder dislocation include shoulder pain after an injury with deformity and inability to lift the arm. Sometimes the ball of the humerus (arm bone) can be felt in front of the shoulder. The signs of recurrent instability include repeated dislocations sometimes with only minimal trauma such as reaching back over your head. The shoulder is a ball and socket joint, but the socket is relatively shallow, making the surrounding ligaments and muscles important for keeping the shoulder in place. An injury that causes a traumatic shoulder dislocation typically tears or stretches the surrounding structures of the shoulder joint allowing the head of the humerus to “fall off” of the glenoid (shoulder socket). A typical injury that causes an anterior shoulder dislocation involves the arm being forced backward when it is outstretched over head such as a quarterback attempting to throw a football and having his arm jerked backward by another player. Recurrent dislocations can occur if the ligaments do not heal properly after the initial dislocation or if repeat injuries cause the ligaments to stretch out over time. A dislocation can also tear the labrum causing a Bankart lesion. A Bankart lesion is usually diagnosed with an MRI. With stretched out ligaments/capsule or a large Bankart lesion, even minor injuries or sometimes simply certain positions of the arm can cause a dislocation. Shoulder instability can also be caused by a genetic predisposition with loose joints/ligaments where the shoulder can dislocate or sublux (partially dislocate) with minimal trauma or even by the person’s own volition. On top of being painful and generally unwanted, repeated dislocations increase the risk of developing arthritis in the shoulder and need to be avoided. The first goal of treatment after a shoulder dislocation is to reduce the shoulder dislocation (put it back in joint). Sometimes this is done by the patient prior to presenting to the physician, but often it requires sedation and a special reduction maneuver by a physician to reduce the shoulder dislocation. After a patient’s first dislocation, the treatment is usually non-surgical and involves wearing a sling for 2 weeks followed by a rehab program to allow the ligaments to heal and to strengthen the surrounding muscles about the shoulder to help prevent future dislocations. After a second dislocation, the likelihood of repeated dislocations is much higher. At this point, depending on the cause of the dislocations, the patient’s activity level and future goals, surgery may be considered. 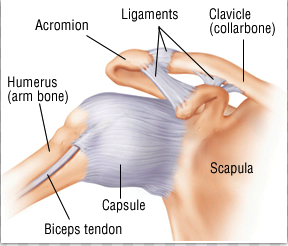 If surgery is required, it is typically performed with an arthroscopic technique with several small incisions made about the shoulder to insert a camera and the necessary instruments to repair the labrum (Bankart lesion) or tighten the shoulder capsule/ligaments. If many dislocations have occurred, there may be some bone loss on the humeral head or glenoid. If this is the case a more complex bony procedure may be required. After surgery, a period of rehabilitation lasting 6-12 weeks is required with a specialized physical therapist to regain motion without re-injuring the labrum/ligaments. If you have signs or symptoms of shoulder instability feel free to call our office to schedule an appointment with one of our fellowship trained Orthopaedic hand and upper extremity surgeons that specialize in both the non-surgical and surgical treatments of shoulder instability.